Dumpsters are a handy tool for anyone with a project that is going to generate a lot of garbage that will need to be removed. At Ace Dumpster Service, we provide the most reliable dumpster rental service and trash removal in the Taylor, Wayne, Monroe, and Oakland County Michigan area. You don’t have to take our word for it. Just drive around town and you will see construction sites, home remodels, and other locations with a solid Ace Dumpster standing sentry out front. 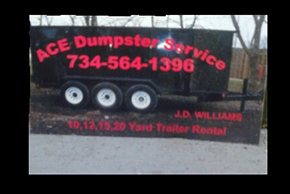 Ace Dumpster Service will deliver and set up the size of dumpster you need at a price you can afford. When you finish your project, just call us and we will remove the filled dumpster and dispose of the trash. Our reliable and experienced crew will work with you to place the dumpster where and when you need it so it will be most convenient. We can also help you determine the size of container you will need to handle all the construction materials, junk, waste, debris, and old kitchen sinks you are likely to generate when the project gets up to steam. We specialize in providing rubber tire dumpsters, which are like a trailer and are pulled to your site behind a truck. These types of dumpsters require no special set up or removal, and they won’t damage your sidewalk or driveway, and they can even be parked in the street. Rubber tire dumpsters typically need no special permits. Most homeowner’s associations approve their use, and their rental won’t bust your construction budget. We at Ace Dumpster Service take pride in our reputation of providing prompt and efficient service. Area construction companies and homeowners know that they can depend on us to for top-level dumpster rental service and trash removal at the lowest possible price. Fees include delivery, pickup, rental, and disposal fees. Whether you need a big or small dumpster, Ace Dumpster Service has the size to fit your needs, from lidded 6-yard units that will handle small trash, to giant 30-yard titans that are available to take on roofing materials, pallets, drywall, and those old kitchen sinks. Commercial trash removal through Ace Dumpster Service also is available throughout the Taylor, Wayne, Monroe, and Oakland County in Michigan with containers from 6-yard to 30-yard sizes. We depend primarily on word-of-mouth advertising. That means we are dedicated to your satisfaction so you will pass along a recommendation for our services to your friends and neighbors. When you need reliable, safe, and clean dumpster rental service and trash removal in Taylor, Wayne, Monroe, and Oakland County in Michigan you can trust the professionals at Ace Dumpster Service. Call us for a consultation and list of prices.